Image Source: Pexels user Jessica Lewis. However, IoT devices have some security vulnerabilities that sometimes make them the targets of cyber attacks. Enter blockchain, a digital ledger used to transmit data or make payments in a secure and decentralized manner. Blockchain is the backbone of Bitcoin and other cryptocurrencies, but the technology is also revolutionizing cybersecurity. When a business, individual or multiple parties use blockchain, it is harder for hackers to access sensitive user information because there is no centralized server to exploit. This quality makes blockchain a unique technology that can protect IoT devices all around the globe. Anyone who owns an IoT device may fall prey to cybercriminals breaching their device and garnering their personal data due to the large amount of existing and projected data that each device processes. The more devices or data an IoT device is connected to, the higher the chances of a breach. It doesn’t matter what device, manufacturer or service provider you have; none of them have perfect security at the moment. A Gartner survey found that organizations with IoT systems are more concerned about security than any other technical elements. With these concerns in their mind, it’s no surprise that business leaders are digging for ways to protect their IoT devices and services in a way that is simple, efficient and effective. That’s where blockchain comes in. The technology may soon be the go-to method of protecting IoT apps and devices. Blockchain security often goes hand-in-hand with smart contracts, which allow businesses to create, negotiate and confirm transactions or contracts without a third party. Smart contracts register and validate information in a network without a central system, eliminating threats such as denial of service or man-in-the-middle attacks for IoT devices. Smart contracts pave the way for an IoT network to record metadata and results for regulatory purposes. They also securely store and share information on software updates. These updates carry with them a cryptographic hash to conceal the information within these updates. IoT devices running their security on blockchain can then use the hash to verify that everything is in order. Plus, smart contracts manage and optimize transactions and interactions across devices. In other words, they allow two parties to reach an agreement without any confusion. Blockchain makes it possible for a ledger to ensure that both sides have met the conditions of the agreement, including the price of an asset in a business transaction. Blockchain can also automate payments to businesses while opening the door for smaller payments across devices in some networks. Thanks to its decentralized nature, only the parties involved in the transaction can access the details, keeping cybercriminals in the dark. Cybercriminals target IoT devices with hacking and other malicious activity that tampers with the data of the devices and its users. They can also lock users out of their devices, leading to larger issues such as the ability to shut down an entire IoT network. Such breaches are costly for businesses, as the criminals may require a large monetary sum to return access to the network, while others may publicly reveal the data of a network’s users. Some companies are taking steps to curb the chances of being negatively impacted by these attacks, including Hyundai. The car manufacturer launched the Hyundai Digital Access Currency (HDAC), which uses blockchain and tokenization—replacing clear text with randomized characters—to protect its IoT network. The technology allows for encrypted communication across devices and makes it possible to conduct secure financial transactions. Such solutions should be implemented in order to protect IoT devices moving forward. By eliminating the need for a third party to execute transactions and agree to terms for a contract, businesses can scale up with their IoT strategies without having to worry about their network being compromised. Blockchain is one of the most exciting technologies in the world because of its ability to create a more secure digital environment. And this is especially key in the IoT space as more companies adopt the capabilities of smart device technology to expand their reach and bolster the link between their brands, workers and device users. If you want to develop an IoT app or secure an IoT device, turn to SevenTablets. Our experienced developers offer digital solutions in IoT and mobile security. We’re also well-versed in other emerging technologies, including artificial intelligence and machine learning, predictive analytics, augmented reality, and virtual reality. 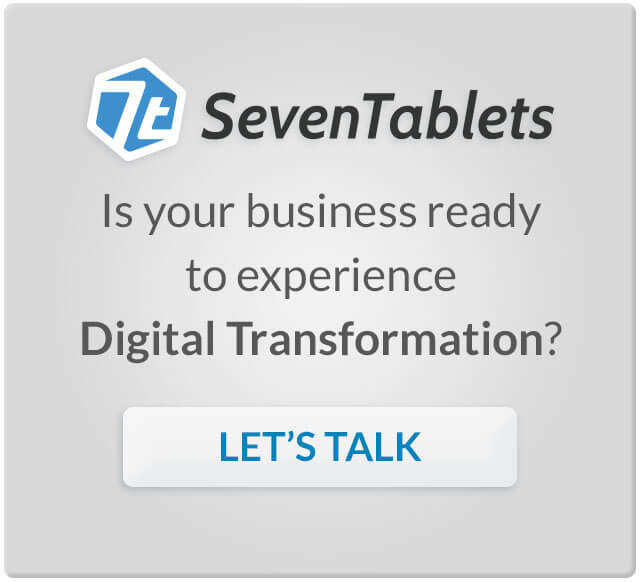 SevenTablets is headquartered in Dallas, but we also work with customers in Austin, Houston, and beyond. To discuss your IoT project, please contact us today.